Tesfaye with his wife Wuba and their kids at home. The smart farmer is known as a „wise man“ in the community regardless his young age. 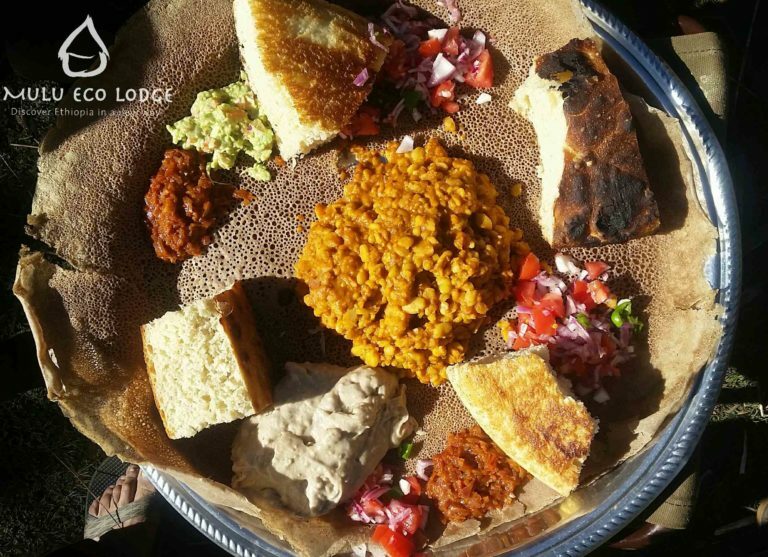 A local saying: If there is no Injera in heaven, I dont go! Some women of the community mill with the millstones (not flour but chalk for the wall paints). A Grinding Mill for the Women of the Community. In our organisation the farmer community decides what projects are urgent for the development of the region. Their main concern was an elementary school for their kids, the second one a grinding mill for their women. 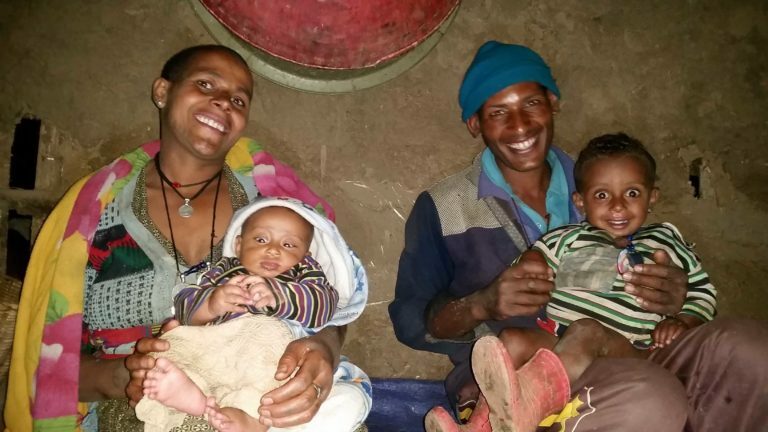 All farmers in the Choke Mountains live in subsistence and grow potatoes, crops and vegetables for their families. 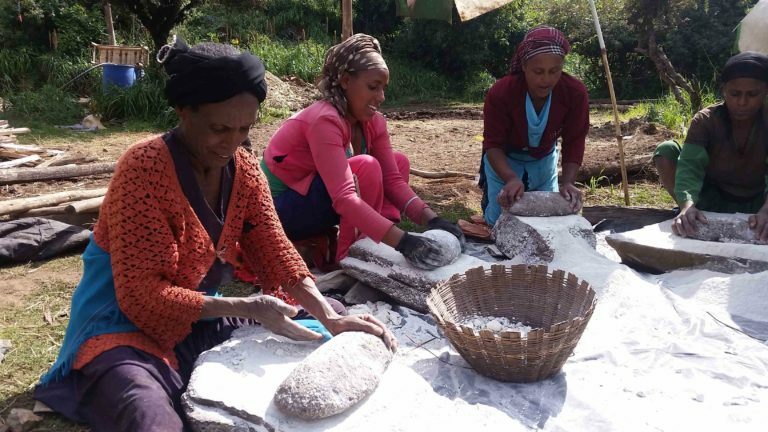 But to make the Ethiopian Injera and bread out of their grains the women first have to mill flour. Lot of women mill the grains at home with a little millstone, kneeing on the floor for hours. This causes several physical complaints: their knees are scratched, their hands hurt, their backs get chronical problems of this unhealthy position. Additionally, otten an infant is thight on their back. Some women also walk the long way to the next village with a Diesel ginding mill. They have to carry about 50-80 kg grains on their back and infants in front. Young children have to walk with them because they cant stay at home by themselves. Once she is there, she has to queue up in a long waiting line for the mill. It often takes several hours of waiting, sometimes the whole night. When it is her turn, the mill owner asked for a random price to mill her grains; he knows that he is the only one with a mill. If she cant afford that she has to go back with her unmilled grains and do it at home on the floor. An Enat Ethiopia e.V. Community Grinding Mill would change that! The farmer would decide about the mill, fix prices, that all of them could afford and save that money for maintenance and other costs of the mill. Please help and donate with the keyword „grinding Mill“! Or contact us for more details and finances.